The Black Pack for the Rapid adds visual elements like black alloy wheels on the top-end elegance variant. Skoda has been struggling to keep up with its competition in India. It currently hold less than 1 per cent market share in India, according to sales figures for the month of October 2014. Skoda had launched the new Rapid sedan in September, and the car has been selling just over 1,000 units every month since. This is a far cry from the segment leader, the Maruti Suzuki Ciaz which has sold over 6,000 units in October 2014. Skoda is now offering discounts on all variants of the new Rapid, except the DSG-equipped diesel variants. The Skoda Rapid is priced from Rs. 7.22 – 9.82 lakh for the petrol variants, while the Rapid diesel variants (not including the DSG-equipped automatic variants) are priced from Rs. 8.39 – 9.87 lakh. All the prices mentioned above are ex-showroom Delhi. The discounts offered include free 1st year comprehensive insurance, a Rs. 30,000 exchange bonus, free 4-year road-side assistance and 4-year warranty. Corporate discounts will also apply to those eligible for it. The new Skoda Rapid is now powered by either a 1.5-litre diesel engine (which replaced the 1.6-litre diesel offered earlier) or a 1.6-litre petrol engine. The 1.5-litre diesel engine is mated to either a 5-speed manual transmission or the brilliant 7-speed DSG automatic gearbox. 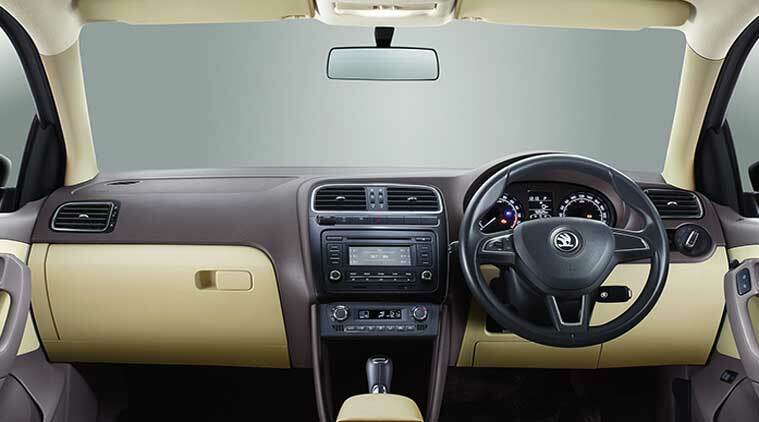 The Skoda Rapid diesel DSG is one of the few diesel automatic sedans in the segment, the others include the Volkswagen Vento DSG and the Hyundai Verna automatic. On the other hand the Skoda Rapid petrol is mated to either a 5-speed manual transmission or a 6-speed triptronic automatic. The Black Pack for the Rapid adds visual elements like black alloy wheels, black grille, black ORVM covers and blackened headlamps on the top-end elegance variant. Other additions on the Rapid include cruise control and rear parking sensors.